Welcome to Columbia County! We’re thrilled the world’s best golf brought you here and hope you’ll find some time to explore all that our beautiful County has to offer. You’ve caught us in the middle of some incredible growth… Since the 2010 Census, Columbia County’s population has grown by 22%. We’re thinking the secret is out…this is a great place to visit and a wonderful place to live! From unique eateries and shops to gorgeous natural resources, Columbia County has many things we hope you’ll take the time to discover. 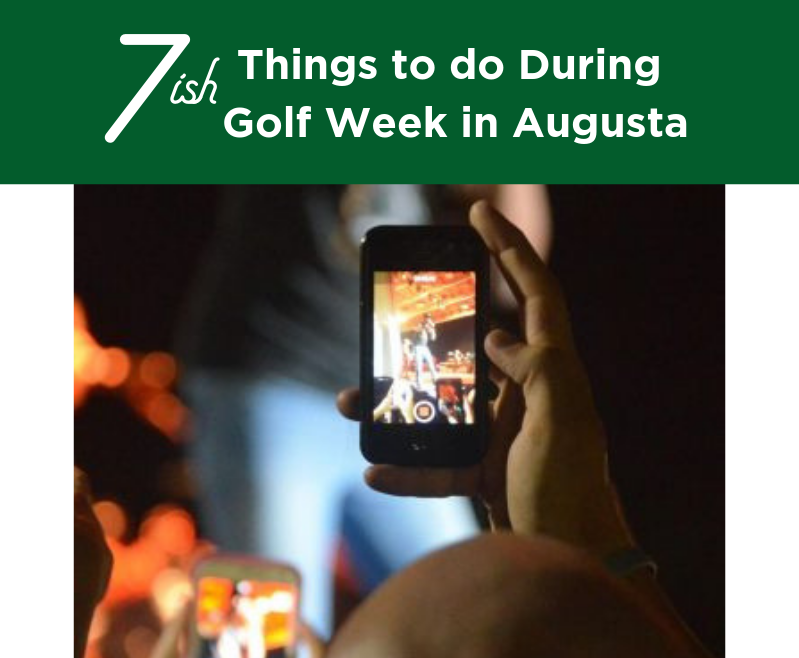 Here are a few suggestions of our favorite Masters Week activities. Try your hand at a different kind of golf at the International Disc Golf Center (IDGC). The IDGC, managed by the Professional Disc Golf Association, is located at Wildwood Park in Appling, GA. The center features a Pro Shop, the Ed Headrick Memorial Museum, a training center, practice putting greens and three championship caliber courses. Tee up. Something about watching the world’s best golfers makes you want to hit the links! Our beautiful courses will make you feel like you’re Bubba Watson in a sudden death playoff on #10 with a 40-yard hooking wedge through the magnolia and cherry trees. Well, not quite that exhilarating but almost! Bartram Trail Golf Club is a beautiful public course offering MiniVerde fine bladed Ultra Dwarf Bermuda grass and features five par 5’s and five par 3’s. Champions Retreat Golf Club, the only club in the world featuring three individually designed courses by Arnold Palmer, Gary Player and Jack Nicklaus. As if that’s not enough, this prestigious course is home to the inaugural Augusta National Women’s Amateur. For one week only, this private course opens its gates to the public. Call in advance to check on available tee times and their Play at Night event, which features a happy hour, access to the practice facility, cash bar and live DJ. Tickle your funny bone at the Laurel and Hardy Museum of Harlem, GA. The historic town of Harlem is the birthplace of Oliver Hardy who is one-half of the infamous duo, Laurel and Hardy. The Laurel and Hardy Museum celebrates the legacy of Hardy and his comedic partner Stan Laurel. Admission is free but donations are greatly appreciated. Paddle our warm southern waters! Columbia County offers three waterways for paddle sports: Clarks Hill Lake, the Augusta Canal and the Savannah River. Kayak rentals are available through Augusta Outdoors, Cole Watkins Tours, Keg Creek Watersports and Savannah Rapids Kayak. We’re sure glad your “Highway 20 Ride” brought you to town. If you’re like us and prefer your “Chicken Friend”, make plans to see multi-platinum, Grammy Award-winning, southern rock group, Zac Brown Band. They will take the stage on Thursday, April 11 at Evans Towne Center Park as part of their Down the Rabbit Hole Tour. The weather in Georgia can be unpredictable in April. Should the rainclouds move in, we’ve got you covered with these fun indoor activities. AR Workshop: Work with power tools as you DIY an amazing project you will be proud to display in your home. For a full line up of classes, visit their calendar. Active climbing Indoor Rock Climbing Gym and Ninja Center: Active Climbing features 18,000 square feet packed full of 30 ft tall rope climbing, World Cup style bouldering and ninja warrior obstacles. While in town, we know you want to sample the south’s best cuisine! Check out a complete listing of Columbia County restaurants or one of our Culinary itineraries!